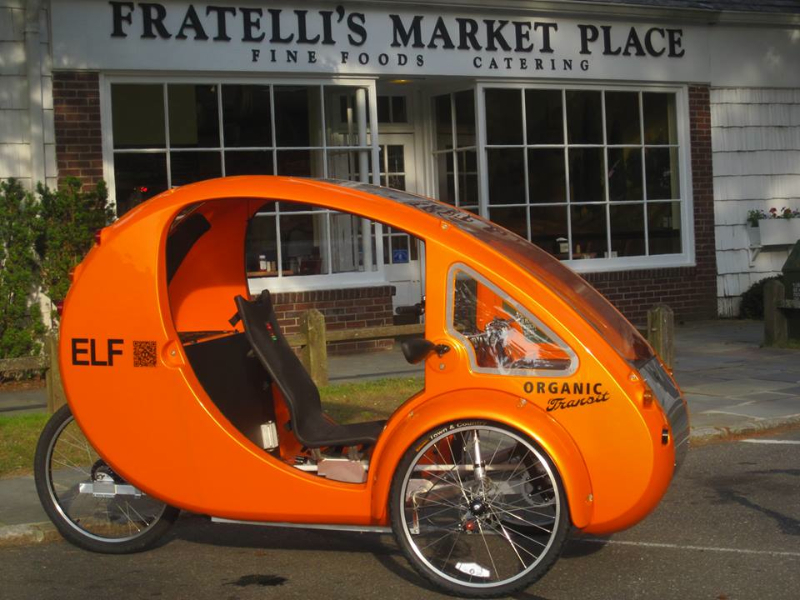 Electric recumbent trikes are lightweight 3 wheeled pedal/electric vehicles that offer some car like features. For instance, some of them have weather protection, cargo & passenger capacity, full suspension, comfortable seats, lights & mirrors, etc. Some of these e-recumbent trikes are designed for everyday commuting around town and some of them “amplify” your pedal power up to highway speeds! The all-in-one electric bike kit market is heating up and EVELO just added their new Omni Wheel to the mix. The Omni Wheel is a front wheel system that will make converting a traditional bike to electric pretty easy, while keeping the drivetrain the same. Falco E-Motors has just launched their new Fusion Sports electric bike kit on Kickstarter. This is a unique kit because it is cardio controlled. What does that mean? You can set the heart rate range that you want to be exercising in and the Falco Fusion Sports system will vary the amount of assist to make sure you stay in that range. High tech! ProdecoTech Stride 500 electric bike. If you are new to electric bikes then this article will help you get a quick understanding of what electric bikes are all about. and how to checkout electric bikes in your town/city. The E-BikeKit headquarters and assembly facility. Jason Kraft is the CEO of Electric Bike Technologies and he recently invited me to tour their headquarters and assembly facility that is located just outside of Philadelphia, PA.
Electric Bike Tech offers a variety of moderately priced electric bike kits (E-BikeKit™) and electric trike kits (E-TrikeKit™). They focus on providing kits that have a lot of features for the money. It was great to get the personal tour from Jason and learn more about this US electric bike kit company. 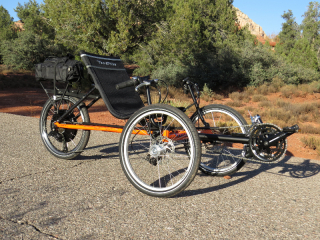 Since there has been a growing number of electric recumbent trikes hitting the market recently, I thought it was about time to try one out in a review. By combining the popular TerraTrike Rambler and E-BikeKit Electric Bike Conversion System I thought this would be a good way to dive into the e-trike world! Electric Bike Factory, in Fort Myers, Florida, has made the simplest, and perhaps oldest successful design for a DIY electric bike conversion kit in the USA since the 1990’s. 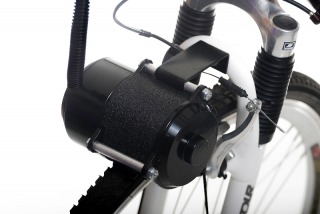 The friction roller system (sometimes referred to as a “tire scrubber”) is similar in function to the EV Warrior, the ETC, and the Zap systems that were the pioneering ebikes of the 1990’s. E-Bike Kit: Specs, Pictures, & Video for Geared Front Motor & Lead Acid Battery. Here is an introduction to The E-Bike Kit that recently arrived for riding and review. This is the 350 watt geared front hub motor with 36V 9ah lead acid battery kit. 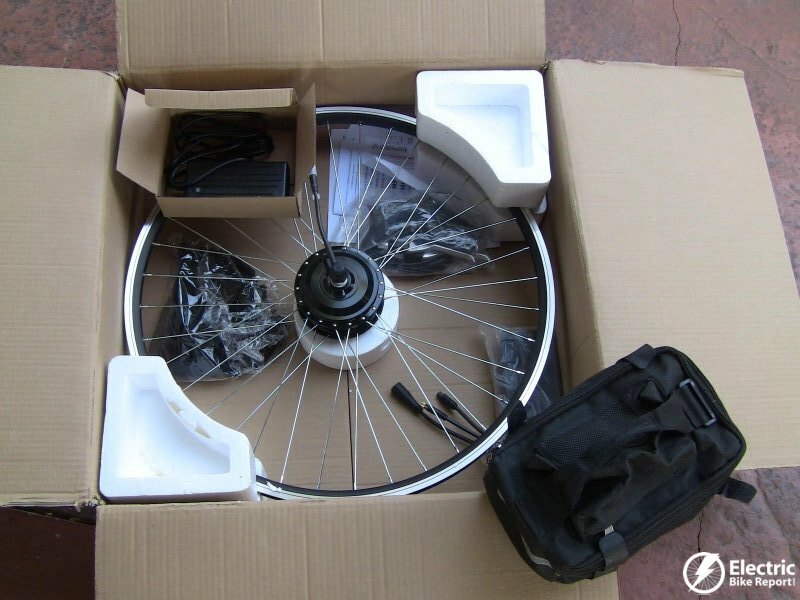 E-Bike Kit offers other kits including front or rear direct drive hub motors, rear hub geared motors, and lithium ion batteries. They offer their kits in many wheel sizes: 700C, 26″, 24″ and 20″. Here is VIDEO recap of the electric bike news from the week of November 8, 2010. This is just a quick overview of the news and other ebike things that caught my eye as I surfed through the web looking for cool electric bike happenings! If you would rather read about this news, you can it out the e-bike news here. I have ridden many different bikes with the Bionx electric bike conversion kit and I have to say that it is probably the most refined ebike kit that you can buy. To compare it to cars, it is like the Mercedes Benz of electric bike kits. This is a review based on a number of rides on the Bionx electric bike kit. This is not an in depth review based on hundreds of miles of use, etc. I just wanted to let you know what I think of the system based on some ride experiences.